Kind of twiddling my thumbs waiting for the CFC ice interdiction to be called complete. But, thanks to some productive weekend work, I have been quickly expanding how I can parse/crunch this data and get it out even faster than before. Thanks to my recent eve-marketdata history scraper, I can quickly generate all the data I care to analyze. I have a couple plans for some zkb data to pair sales/killed data together, but you'll have to watch my github for progress. First is an attempt to recreate the in-game market history. Unfortunately, there are some volume spikes that make that unfriendly. Also, trying to color in between the max/min lines is beyond my fu. But it does create an interesting view of the market so far. The funny thing being the price slopped up into the interdiction announcement, but quickly lost steam once the event went live. Next up is a 'topes vs blocks chart. Again, we're seeing that the announcement really pushed the price, but once the even drops, the activity is lack-luster. The desired 1k/isotope price only sticks around for a short period, then rebounds right as the event starts, but quickly evaporates. Thanks to JMP, I can build a pretty graph outlining the reality since before this whole ice SNAFU started. 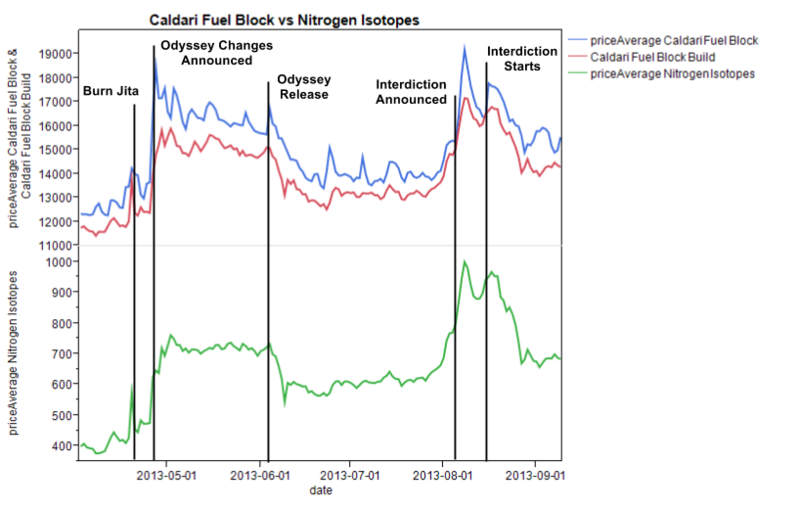 The interesting thing here is how fuel costs are settling near pre-odyssey/post-announcement levels. This represents a +10% increase from the summer normal. Though the cost of operating a POS grows ever higher, the ramp in month-to-month costs is pretty flat and not really enough to cause issues in manufacturing. Just thought I'd spit out some quick words/charts on the matter. Hope to have a more complete analysis for TMDC in 2wks once the data has shaken out!